So I wanted to start by announcing that this is More Than You Can Chew’s first fish dish! Yay for fish! To be honest, I don’t eat fish as much as I’d like to, hence the scarcity on this blog. Ugh, I know, but Devin is not the biggest fan and there are very few fish options whenever we go grocery shopping so It’s just not something we usually buy. But, of course, leave it to me to make my first fish recipe to have jerk somewhere involved! Jerk seasoning originated from Jamaican when slaves fled British invasion and were forced to adapt to new surroundings. They used the plants and spices available to them and developed this incredible seasoning that became a Jamaican staple. 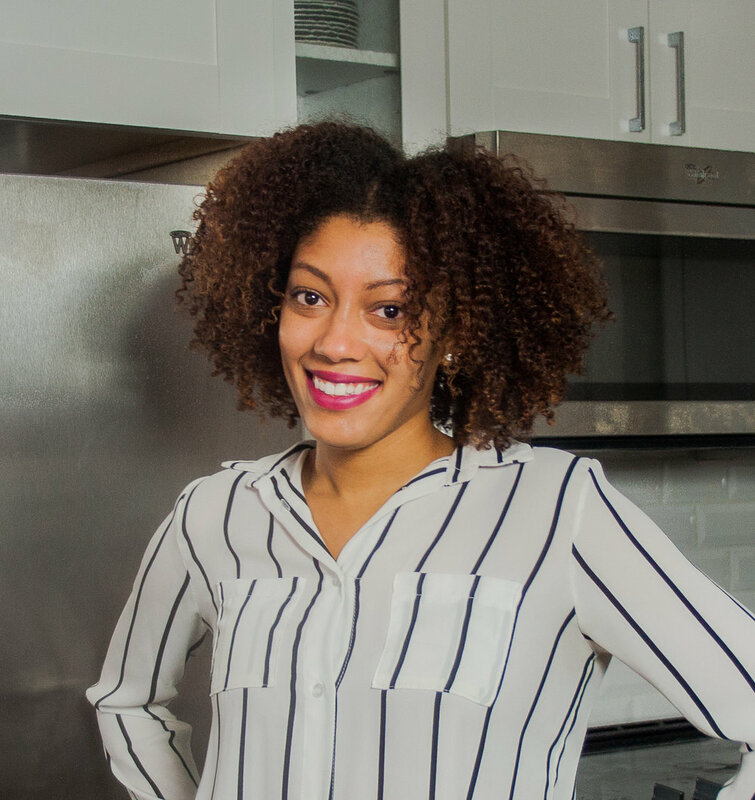 Coming from a large West Indian family who’s had heavy influences from Latin, Caribbean and African cuisine, jerk was something that I’ve had TONS of, whether on chicken, pork, shrimp or fish, and I love it with a passion! Jerk seasoning comes in either a dry or wet form and have a variety of spice levels from mild to very VERY hot. I’ve used both wet and dry in my recipes before, but I found it easier to make and store dry seasoning so that’s what I primarily use. I’ve included a recipe for my homemade jerk seasoning at the bottom of this post but feel free to use store bought seasoning. Either wet or dry will work for this recipe. So now let’s talk mango salsa. Typically, restaurants that serve jerk dishes (except traditional, local Jamaican spots because ain’t nobody got time) accompany them with a sweet sauce or salsa. Usually it would have mango or pineapple involved. The sweetness of the fruit brings out the brown sugar in the jerk and it is damn good, especially if you’re eating it with fish or shrimp. Whenever I have a mango or pineapple salsa with my jerk, I like it to be extra spicy because spicy and sweet = HEAVEN! Lastly, I like to accompany it all with either brown rice or quinoa and some greens. This is totally optional but I figured this is already healthy, might as well go full monty and add more healthy stuff! 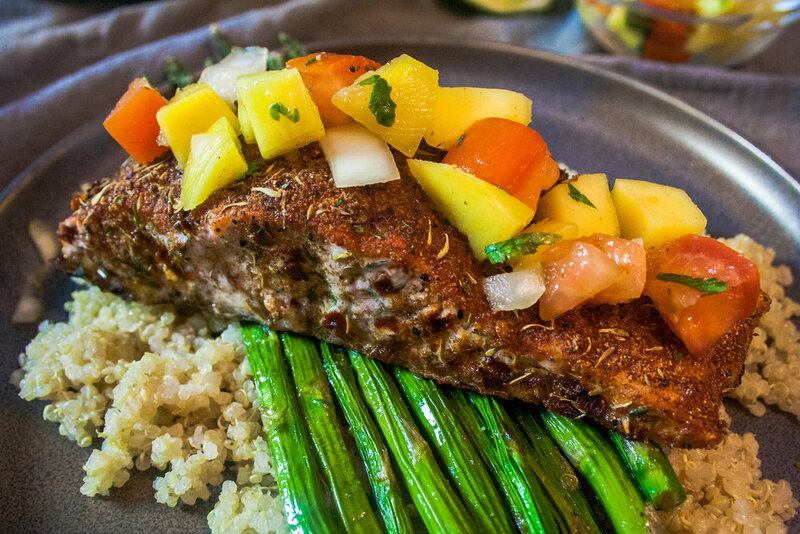 This recipe as written only includes salmon and salsa, but literally it’s not that hard to make quinoa and greens if you choose, but I wanted to make the salmon and salsa the main stars of this dish. Eating it just like this is perfectly fine! So, what are your thoughts about jerk seasoning? Have you tried it or cooked with it before? Let me know in the comments and let me know if you tried this recipe! Generously season each filet with dry jerk seasoning, coating the entire piece, about 1 tablespoon each. Align salmon on a foil-lined baking sheet and bake for 18-20 minutes until salmon in thoroughly cooked. Meanwhile, prepare mango salsa by adding mango, onion, tomato, cilantro and juice of lime to a bowl. Season with salt, pepper and cayenne, if using. Mix until well combined. 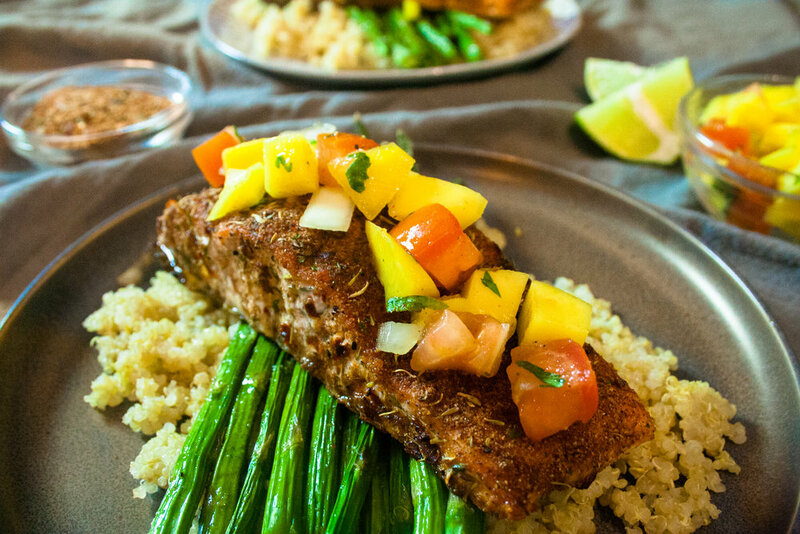 Remove salmon from oven and serve with mango salsa, rice or quinoa and your favorite veggie. Combine all ingredients in a bowl and mix well. Use as seasoning for chicken or pork.